Sk8tape, figure skate tape protects leather from the usual unavoidable scratches, scrapes and scuffs of skating. 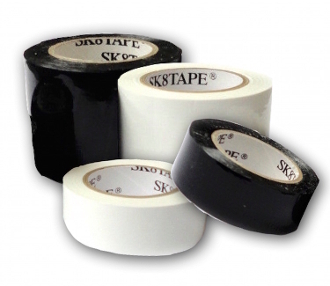 Sk8tape® is waterproof and stays on when skating, yet it can be easily removed when you want it removed. No sticky residue is left behind, unlike other tapes, and it stretches to fit securely around the curves on boots. Sk8tape® is unnoticeable and excellent for all competitions, giving skates a bright, clean shine that no polish can provide! Available in several colors in Narrow and Wide sizes.